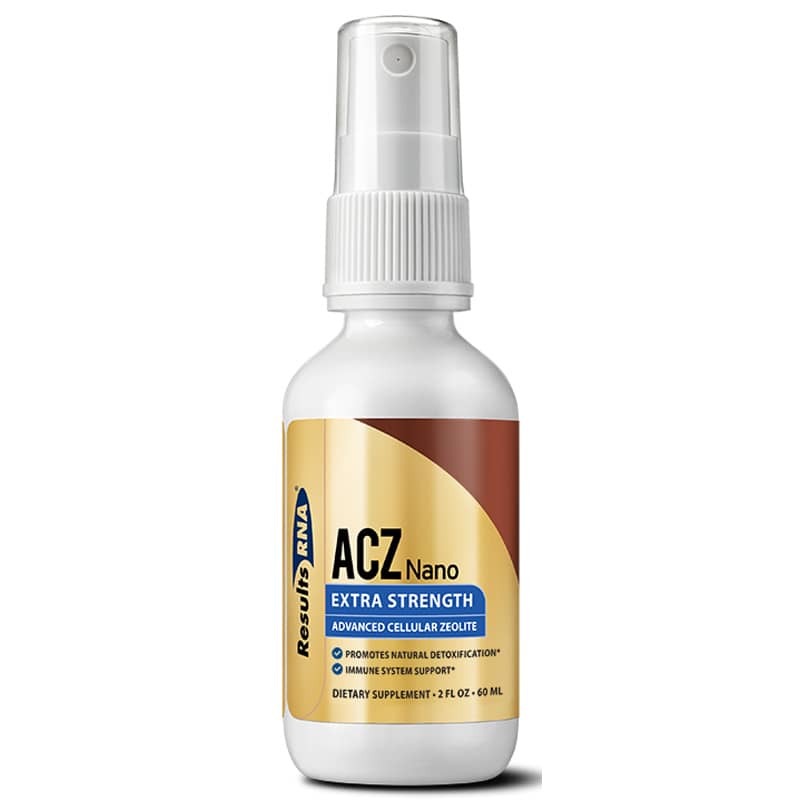 ACZ nano Extra Strength by Results RNA provides the highest concentration of nanomized clinoptilolite zeolite per dose offering far greater detoxification support. ACZ nano Extra Strength works quickly, support detoxifying the blood, cells, and promoting optimal pH levels in the body and, may help to neutralize acute chemical and allergic reactions. ACZ nano Extra Strength is the only detoxification product formulated to support removal of fluorine and chlorine, two of the strongest oxidizing agents known and found in most drinking water. ACZ nano Extra Strength has been shown to increase urinary output of Mercury up to 103,500% over baseline during only 12 hours of post-provocation urine collection. ACZ nano Extra Strength is the only nanomized zeolite formula available with over 90% of total zeolite crystals existing within the nano range as calculated via SEM analysis. Competing liquid and powdered zeolite formulations utilize micronized zeolite, with particles over one thousand times larger than the nanomized zeolite crystals provided in ACZ nano Extra Strength. ACZ nano Extra Strength binds toxic heavy metals, chemical toxins, VOCs, radioactive toxins and free radicals of all types to support removal through the urinary tract, without compromising vital nutrients. Urinary toxin output may significantly increase as nano zeolite particles are readily absorbed into the bloodstream, providing systemic reduction of body burden. Most agents such as EDTA and micronized zeolites, show poor absorption and remain in the gut. ACZ nano Extra Strength provides approximately 1,000 nano zeolite particles for every single micronized zeolite particle provided in competing zeolite products. An unparalleled adsorbent, ACZ nano Extra Strength provides a one million times increase in the actual surface area per equal amounts of zeolite administered. Standard Dose: Take 6 sprays by mouth twice daily. Spray, swish and swallow. You may take other Results RNA formulas immediately. Do not eat, drink or take other formulas for 2 minutes following. Take as recommended by your physician. Remain well hydrated while using ACZ Nano. Easy to order, no problem with international shipping. Get tracking info. Great service. Will keep coming back. I just recently started using these products about a month ago. I'm starting to feel stronger and feel its supporting my immune system. I'm excited about how my body is reacting to them! !